IP Western blots provide highly specific results, yet often suffer from heavy/light chain blotting, contamination, and ongoing interference. TrueBlot® products solve nearly all of these problems through increased sensitivity, less background noise, and enhanced accuracy. Available for goat, mouse, rabbit ans sheep primary antibodies, TrueBlot® preferentially detects the native, disulfide form of IgG, effectively eliminating the appearance of non-specific, immunoglobulin bands from your immunoprecipitating antibody, in SDS-PAGE. 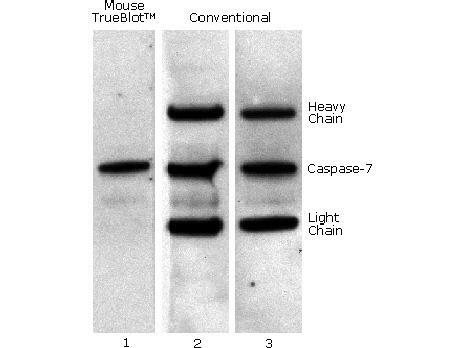 Use TrueBlot® to eliminate 55 kDa heavy and ~23 kDa light chains from masking your proteins. Immunoprecipitation bead sets are also available for goat, mouse, and rabbit. 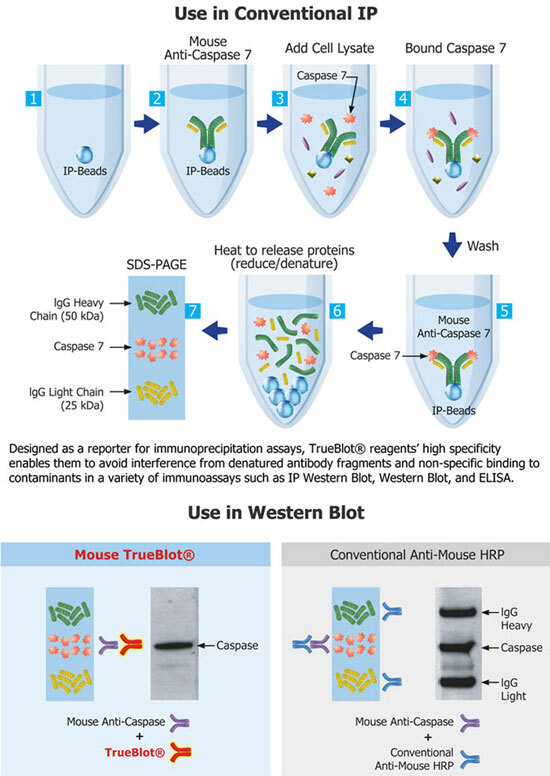 TrueBlot® technology enables unhindered detection of protein bands of interest within IP western blot protocols which would otherwise be obscured by the presence of reduced & denatured heavy and light chain immunoglobulin in the IP blot (as detected by the conventional immunoblotting HRP anti-rabbit IgG reagent). TrueBlot® is the unique horseradish peroxidase conjugated anti-rabbit IgG immunoblotting second step reagent which enables detection of immunoblotted target protein bands, without hindrance by interfering immunoglobulin heavy and light chains from your IP antibody. Use it in place of your usual HRP anti-rabbit IgG immunoblotting second step reagent. It is easy to generate publication-quality IP/WB data with Rabbit IgG TrueBlot®. Easy to Use - HRP-conjugated TrueBlot® anti-Ig simply replaces your regular HRP-conjugated secondary antibody. Accurate Target Detection - TrueBlot® preferentially detects native (non-denatured) Ig, ensuring you are only detecting your target protein. Ideal for studying post-translational protein modifications, e.g. phosphorylation, or protein-protein interactions. Fluorescent TrueBlot®, is the latest format of Rocklands popular TrueBlot® product line and combines the power and specificity of the original products with the versatility of fluorescent and near infra-red dyes. Conjugating highly optimized TrueBlot® reagents to a full spectrum of fluorescent labels, results in multipurpose reporter molecules that can be used in a variety of immunoassays. Infrared fluorescent dyes combined with NIR fluorescent imaging delivers enhanced sensitivity due to low background autofluorescence in the near-infrared region. Therefore, they have higher signal-to-noise ratios when used in immunoassays. Rockland produces TrueBlot® conjugates that can also be used in multiplex assays; where several targets can be detected and imaged simultaneously, resulting in blots that show enhanced detection of distinct target bands labeled by a unique identifying color. Simultaneous detection helps cut time, while ensuring the target molecules are still easily identified.